Today I’m sharing part one of my Morocco travel guide series: Marrakech. This was my first time traveling to Morocco, and it didn’t take long for me to realize that Marrakech is one of the most vibrant and unique places I’ve ever visited. 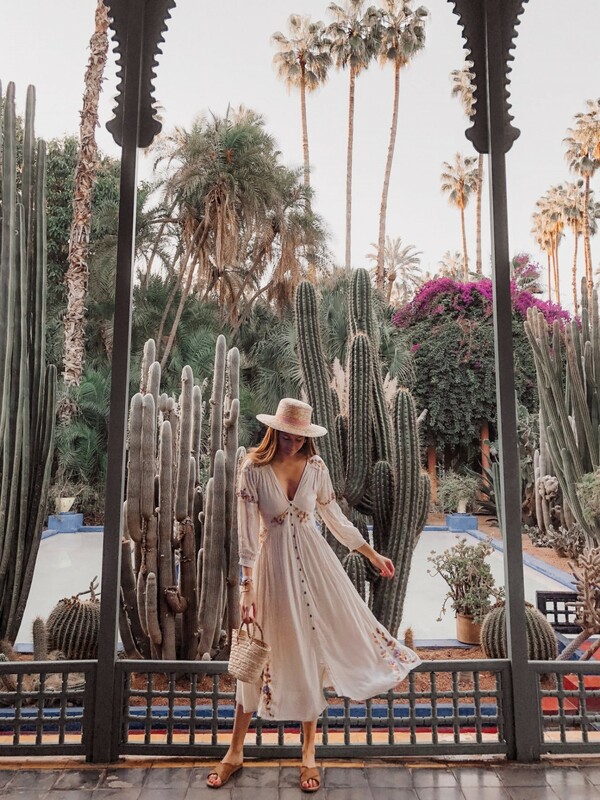 Whether you’ve got a trip booked or you’re just interested in learning a bit more, this comprehensive Marrakech travel guide covers where to stay, where to eat, things to do, what to wear, and offers travel and safety tips to consider before you go. Nomad: This rooftop restaurant is a little oasis above the Medina. They serve modern Moroccan food made with fresh local produce and spices. I got the cauliflower couscous and it was insanely delicious! We had the date cake for dessert which was also incredible. This was probably my favorite meal of the entire trip – be sure to make reservations in advance. Café Atay: This is another rooftop gem that makes for a great photo opp and also serves delicious food. We came right when they opened at 10am with no reservation and nearly had the place to ourselves, but for dinner I suggest booking in advance. I had Nutella crepes and fresh OJ – yum! 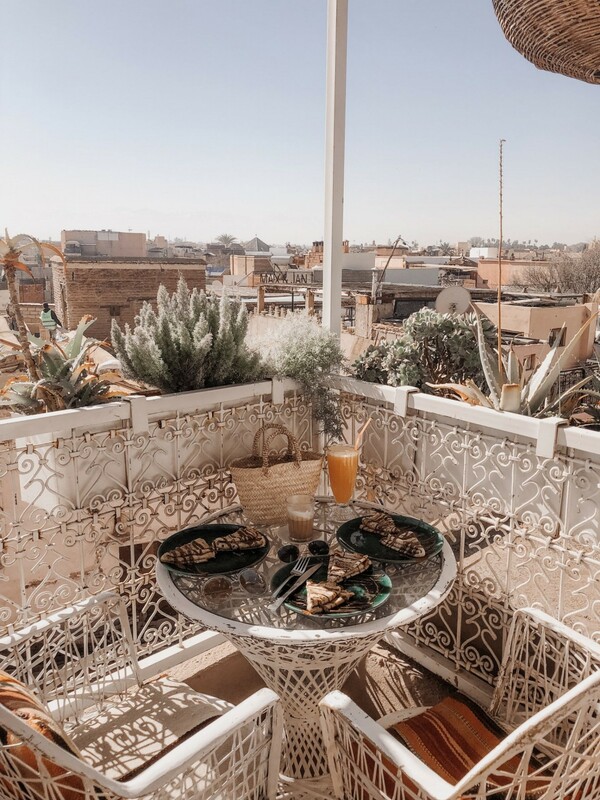 El Fenn: There are a few different spots to grab a bite to eat here, but the highlight of this hotel is their beautiful rooftop. Come for dinner and a cocktail! Be sure to make reservations. Le Salama: This greenhouse-inspired rooftop terrace is absolutely stunning, and they serve delicious traditional Moroccan food. I had the veggie tajine which was so yummy (tajine is a traditional Moroccan dish of spiced meat and vegetables that is named after the unique cone-shaped dish it’s cooked in)! Café I Limoni: While we didn’t have time to eat here, I saw it recommend on many other travel guides. It’s a cute little Italian spot located in a beautiful courtyard filled with lemon trees. Definitely on my list for my next trip! Le Jardin: Located within the Royal Mansour, this relaxed outdoor garden café is the perfect spot to sit back and enjoy a cocktail after an afternoon of shopping. I had this place bookmarked but wasn’t able to check it out on this trip, but it comes highly recommend by others! 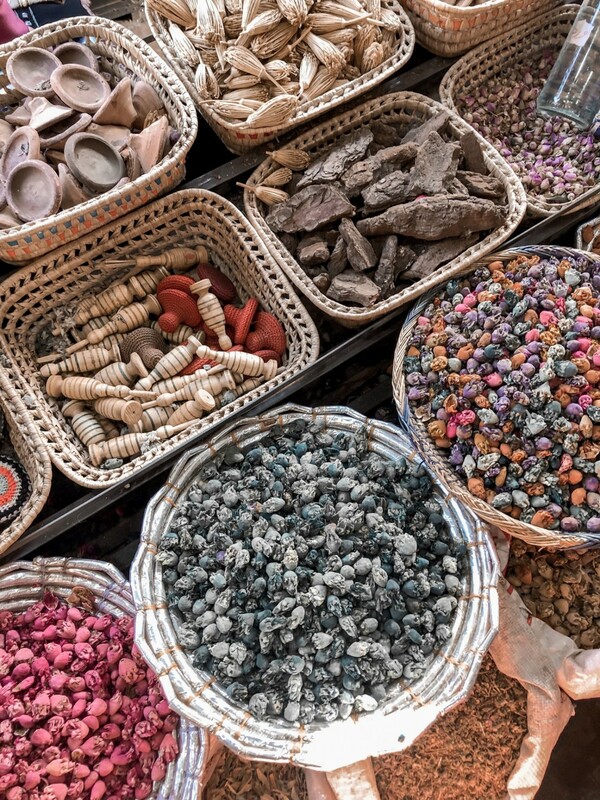 Explore the souks: You can’t take a trip to Marrakech without shopping within the souks. They are bursting with handmade treasures from the famous Moroccan carpets, to lamps, to jewelry, and even spices and argan oil. Be sure to leave plenty of room in your suitcase as you’ll want to buy it all! Visit Jardin Majorelle: Just outside the Medina lies Jardin Majorelle, an absolutely stunning garden filled with cacti and botanical plants. The garden was created for Yves Saint Laurent, and took French painter Jacques Majorelle over 40 years to complete. It’s now one of the most visited spots in Morocco! If you’re after photos, I highly recommend arriving upon opening at 8am. We had the place to ourselves for nearly an hour before it got crazy with tourists. By 10am the line was down the block, and inside the garden was shoulder to shoulder crowded. Next door to the garden is the YSL Museum, which is worth checking out if you have the time. 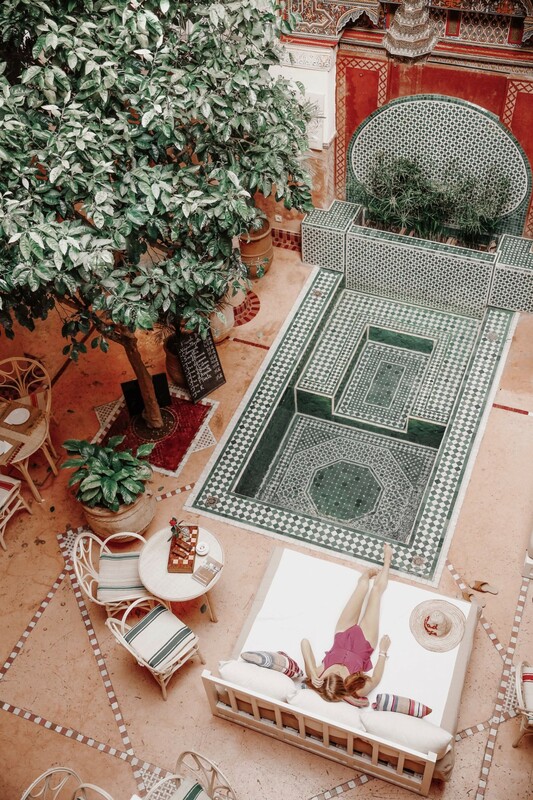 Relax with a traditional Moroccan hammam treatment: While we didn’t have the time to do this, my friend Katie had gone to Marrakech just a few weeks before and highly recommend this traditional Moroccan treatment at the Royal Mansour Spa. Treatments vary from spa to spa, but the general process is that you first soak in a pool or sit in a steam room, then you’re rinsed, exfoliated, and massaged. Sounds heavenly! Take a day trip to the desert: This is the number one item on my list for my next trip, as sadly we didn’t have time to do an excursion (we were only in Marrakech for 1.5 days). If you have the time, taking a trip to the desert comes highly recommended. I would see if your hotel or riad can handle booking this for you, as they will know trustworthy excursion companies. 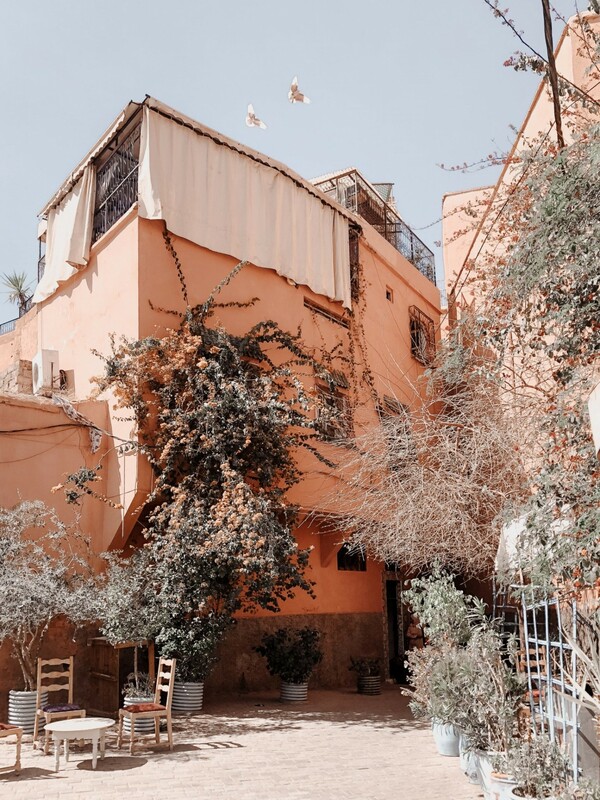 Hike the Atlas Mountains: I would have also loved the chance to explore the Atlas Mountains (Meghan and Harry were just there!). Same as the desert trip, I would see if your hotel or riad can recommend a company to book a tour through. Within the hotels and riads the clothing rules are much more relaxed, and here is where you can feel comfortable wearing swimsuits, shorts, etc. However, when out exploring the Medina and in the souks be sure to cover up a bit more not only to be respectful, but to deflect unwanted attention. 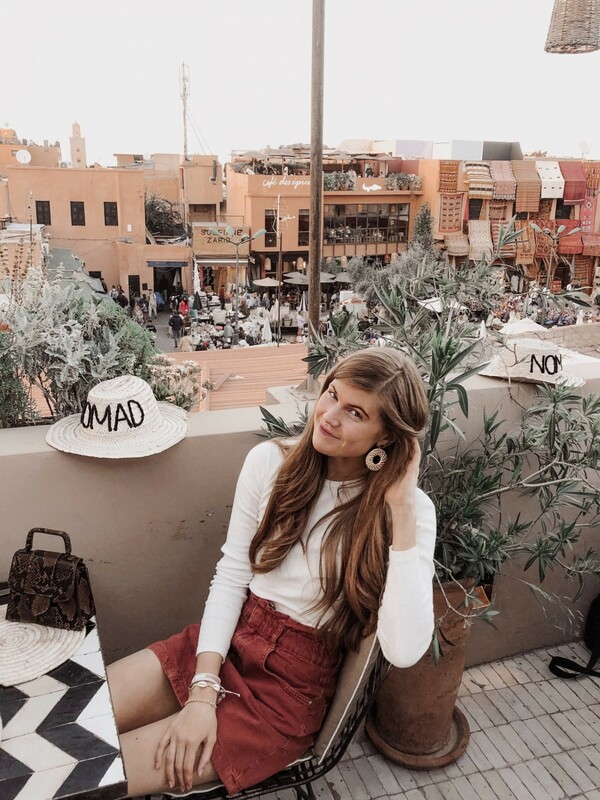 The most common question I got asked was if I felt safe in Marrakech, and the answer is YES. I’ve heard so many different opinions on the topic, from recommendations that women should always have a male guide with them in the souks to suggesting that I shouldn’t even wear open toed shoes! As I mentioned above, I would definitely recommend dressing in a respectful way, as men will catcall and whistle (especially at women wearing shorts or mini skirts). However, I never felt threatened or afraid. Just like when traveling in any part of the world, be aware of your surroundings and never go anywhere alone, especially at night. While we did hire a male tour guide on our first day, our second day we walked around on our own (myself and 2 other women) and we never felt unsafe! Don’t let fear keep you from visiting this beautiful country – use good judgement and you will be absolutely fine. Get a tour guide to take you through the souks for an hour or two on your first day. This will help you get your bearings and learn the layout of the land. The souks can be overwhelming so we really enjoyed getting local tips from our guide. Barter, barter, barter. The shop owners will start high, so stand your ground and know how much you want to spend. A lot of times just walking away will be enough to get them to call you back and accept your price. Shopping in the souks is all cash only, but many of the restaurants now accept credit cards. Just be mindful of how much shopping you plan to do and bring over enough cash accordingly. Dirham is the national currency and it can only be exchanged within Morocco. That means that after you land, you will need to exchange your cash for Dirhams at the airport. Note that any leftover currency you have will need to be exchanged at the Marrakech airport before you leave the country – no other country can exchange Dirhams. A lot of the locals didn’t appreciate being photographed, so always keep this in mind and be respectful. If you want to take a picture in the souks, ask permission or offer to buy something small in exchange for a photo. Be sure to bring a purse that fully zips to avoid pickpockets. While I never felt unsafe, our tour guide was constantly reminding us to keep our bags in front of our bodies. A small crossbody bag or a belt bag would be best for shopping in the souks. The national languages are French and Arabic, but many people also speak English. We didn’t have any issues with a language barrier (although my two travel companions both speak French, which was incredibly helpful!). Note that since Morocco is a Muslim country, many restaurants do not serve alcohol. If you are looking for a drink, I recommend googling restaurants in advance to confirm that they serve it. Depending on your service provider, it’s likely that your phone won’t have access to data while in Morocco. Be sure to map out your directions via Google Maps while still on WiFi, and stick to places near your hotel in the evening to avoid getting lost after dark. 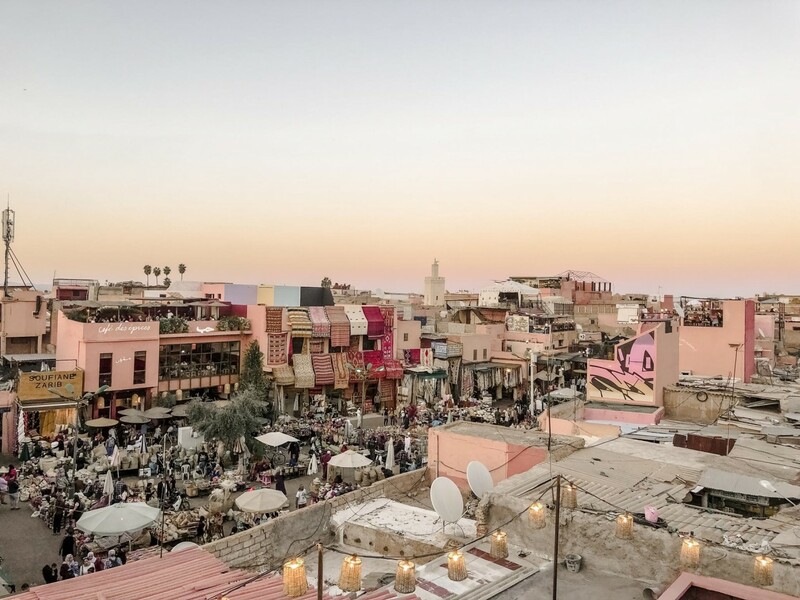 Loving this Marrakech travel guide feature? Take a look here for more of my travel favorites! This was so informative! Thanks for sharing all of these tips Mollie! What a dreamy trip! These photos are breathtaking. Love the post. I was there 3 years ago but some how it feels longer. This sounds like an incredible trip – I love all of the photos… so stunning! I appreciate you being so honest about your experience and all of your tips for feeling safe & comfortable. Definitely things to keep in mind no matter where you’re traveling! 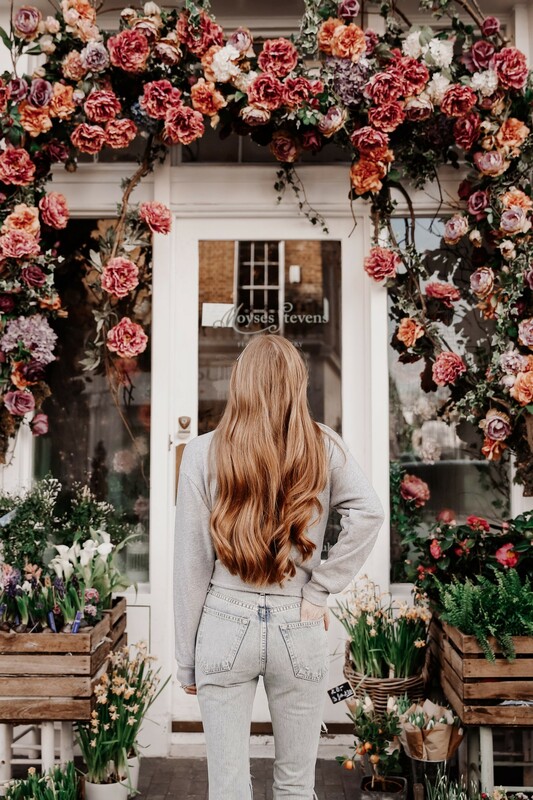 Such great tips and beautiful photos! I would love to visit this gorgeous place someday! 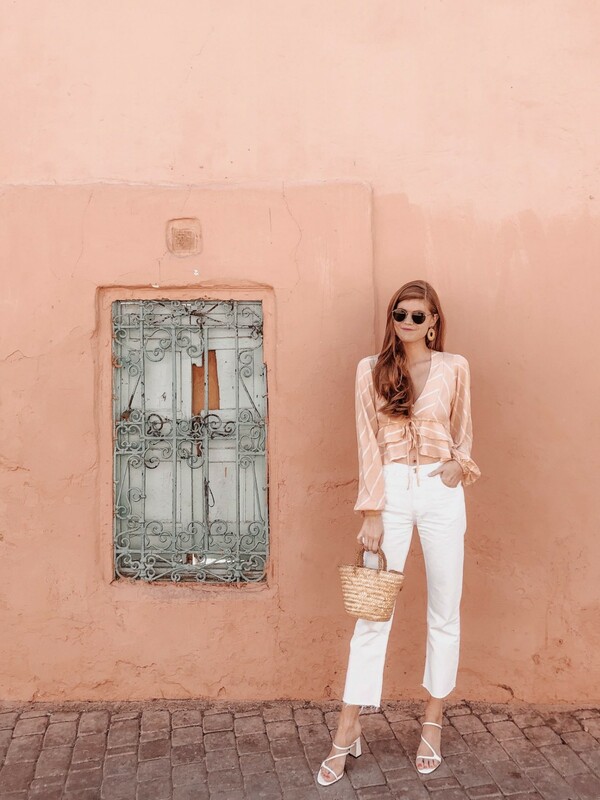 These picture are just stunning and have definitely made me want to visit Marrakech. Saving this for later travel plans! It’s almost crazy to say, but I feel like travel bloggers and instagram have put Marrakech on the map. Every time I see I post I always want to visit! I had no idea that you can’t get currency exchanged before or after the airport. That is extremely helpful info. Thank you! Omg these photos are just breath taking. It looks like you had the trip of a lifetime. I’ve been so interested in Marrakech. It looks beautiful, fascinating, and full of culture! Your travel guide was so helpful! I am obsessed with every single one of these photos! This trip looked and sounds as though it was the absolute best! Thanks for putting this together and sharing with us! I’ve always wanted to go here!! It looks amazing!